The best holes are 2 of the 3 finishing ones. The 16th hole fairway drops down over a ridge, the top of which blends perfectly into the Gulf of Thailand in the background. Both sides of the fairway are framed by palm trees and at the bottom of a hill, that drops down 40 meters, the green is nestled in the bottom of a valley. The back drop is Koh Phangan, home of the famous Full Moon Party, which provides the most majestic view on this Koh Samui golf course. Don’t be distracted, a good shot still needs to be played over the protecting greenside bunker. The 17th is a 500 yard par-5 that is all down hill and plays much shorter. The tee shot is to a wide landing area. From here the green plays about 200 yards away due to the drop. The best option is to layup 20 yards left of the fairway bunker. This shot is to a wide landing area with an easy chip/pitch shot to a flat deep green. 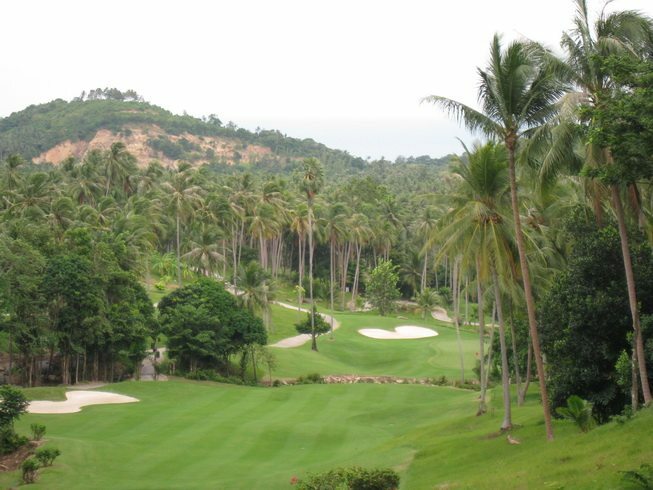 Santiburi Samui Golf Club is a visually glorious course. However, there are plenty of holes to blow up your score. Be patient, leave the driver in the bag, forget the score, and enjoy the views.